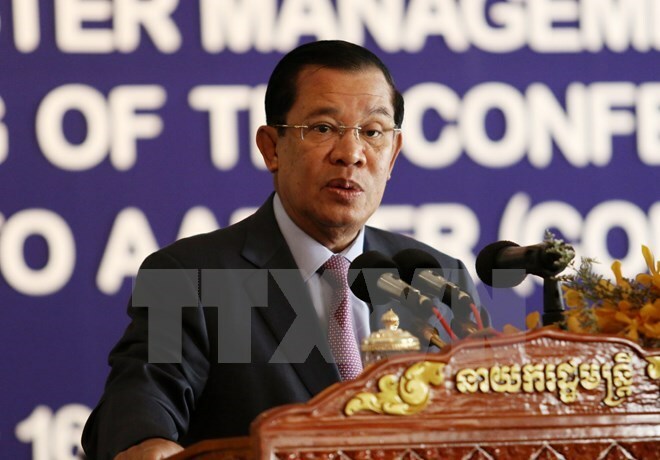 Phnom Penh (VNA) – Cambodian Prime Minister Hun Sen announced on June 13 that there could be no talks between the ruling Cambodian People’s Party (CPP) and the opposition Cambodia National Rescue Party (CNRP) over some CNRP officials who are detained. Speaking at a ceremony in the Phnom Penh, the PM, who is also President of the CPP, asserted that there can be no negotiations because if there is a negotiation it could exert influence over the process of the court. However, he added in case there are any negotiations, the CPP will not discuss cases handled by as well as cases relating to detainees. About 20 people, including 12 CNRP officials have been detained for criticising the government. Of them, an opposition law maker and an opposition senator were arrested jailed over distorting the Cambodia-Vietnam Border Agreement. The two parties reached a cooperation agreement on a “culture of dialogue” in July 2014.